This story was updated at 4 p.m. EDT. When Rep. Jared Huffman first ran for California State Assembly in 2006, he posted up outside the exit during a screening of "An Inconvenient Truth." It was the perfect opportunity. The movie ends with a call to act on climate change, so Huffman passed out flyers and pitched himself as the environmental candidate. "It was one of the most productive leafleting moments of my career," he said. The Democrat in 2013 brought that attitude to Capitol Hill, where he's emerged as a vocal foe of the Trump administration's plans to open up federal waters to offshore oil and gas exploration. At a recent Natural Resources subcommittee hearing, Huffman looked on as a fellow Democrat blasted a Trump official with an air horn to show the impact of seismic testing on marine life (E&E Daily, March 8). Beyond his work on the Natural Resources panel, Huffman has been busy racking up climate credentials. He was recently named to the Select Committee on the Climate Crisis, and he's a co-sponsor of the ambitious Green New Deal resolution. A Missouri native and a self-described humanist, Huffman grew up playing volleyball and Trivial Pursuit and listening to the Beach Boys. He attended the University of California, Santa Barbara, on a volleyball scholarship before obtaining a law degree from Boston College Law School. The father of two recently spoke with E&E News about joining the select committee, shifting Republican attitudes toward climate change and keeping up with pop culture. How did you first become interested in environmental issues? So I got very interested in water policy as a young lawyer. I read "Cadillac Desert," which is this amazing book about water development in the West. 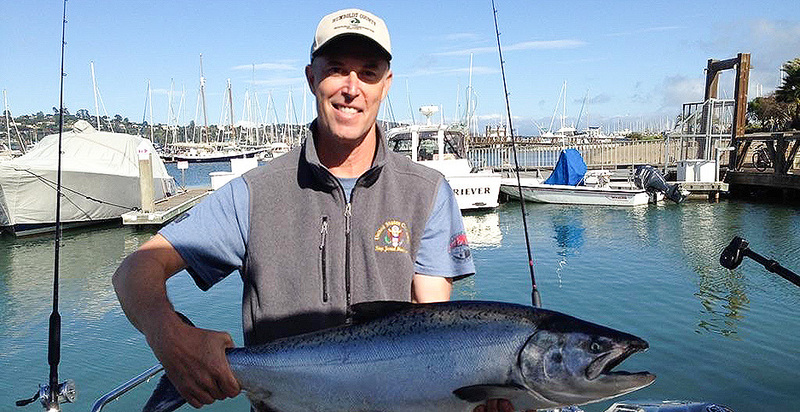 I've always been an outdoorsman and a fisherman, and I began connecting some of this history, some of these policies with my passion for the outdoors and for fishing and for rivers. And that was what really drew me in. You're a co-sponsor of the Green New Deal. What do you think of Republican criticism of the resolution? Look, they are absolutely lying about the Green New Deal. But if they weren't criticizing this, they'd be singling out and lying about something else. So you can't stop them from doing this. And it challenges us to either defend it or, for the faint of heart, some will distance themselves from it. But I will stand by what's in the resolution any day. These are worthy and valid goals. Rep. Rob Bishop (R-Utah) recently ate a hamburger during a press conference against the Green New Deal and suggested the resolution would outlaw meat. What was your reaction? Frankly, anyone who criticizes this, let alone ridicules this, I think has a burden of coming forward with their own answer to this climate crisis. When I look at the harshest critics, including the over-the-top political theater from Rob Bishop and others in the last week, I'm not hearing them offer any solution to the climate crisis. In fact, their answer is just deny it. Deny it exists. Wish it away. You're a member of the House Select Committee on the Climate Crisis. What do you think its role should be in shaping the conversation? You know, we're not confined to any particular sector or issue. We can look at the big picture and make specific policy recommendations that aren't artificially constrained by jurisdictional lines. So that means that there's an opportunity to look at agriculture and public lands and research and innovation. And a bunch of that may not even be on the radar for Energy and Commerce or even Natural Resources. Have Democrats on the panel held any meetings yet? We've had one meeting where we met our committee staff and had a chance to talk generally about the rules and the time frame and some of the possibilities. But we've clearly got more planning to do. [Chairwoman Kathy Castor (D-Fla.)] says she's aiming for the end of March for the first hearing. What do you think of the Republicans named to the committee? When I look at the composition on the Republican side, I see members who have broken with outright climate denial, which is a good thing. But I'm not sure there's an openness to really look at the challenge of changing our energy and transportation and other sectors to decarbonize. I am concerned that they may be willing to talk about adaptation only, and that's not enough. You're also on the Natural Resources Committee, which is often very partisan. How did it get that way? Well, I think you have to step back and think about what kind of people want to be on that committee. On the Democratic side, it's a lot of people who care about the environment and want to work on protecting natural resources. I am sad to say, on the Republican side, it's people who want to champion the interest of Big Oil and mining and extractive industries. And it's pretty much only about that. Now, there are some outdoorsmen, and we can occasionally find a vestige of a conservation interest that we can work with there. At a recent Natural Resources hearing, Rep. Joe Cunningham (D-S.C.) blasted a Trump administration official with an air horn to simulate the impact on marine life and protest offshore oil and gas drilling. What was that like? [Laughs] It was actually my air horn. And it was really loud. When I made the comments about my staffer Laura's baby kicking, that's true. I mean, she literally leaned over and told me her baby started kicking. So that was a moment of levity, but also a moment of validation for everyone who's accepted the obvious that these high-intensity sounds are disruptive to living creatures. And the idea of blasting something far more powerful — 16,000 times more powerful — right into the middle of the migratory and calving habitat of the most sensitive whale in the Atlantic, that's crazy stuff. You were a co-founder of the Freethought Caucus. What is the story behind that? Well, it's a group of members who feel strongly about the secular character of our government. And the 10 or so members that we have, which is way more than I ever thought we would have, approach it from different perspectives. I myself am nonreligious, and kind of experiencing the constant religious tropes that we have dragged into Congress and imposed on us, that has made me bristle. And I think it contravenes the Constitution and the spirit of our secular government. Let's talk about your background. You're originally from Missouri. What was it like growing up there? Well, I was a kid that was born in the wrong place. I grew up in Independence, Mo., dreaming of volleyball and listening to the Beach Boys. I was the youngest of three boys. Single mom, lower-middle-class home, nothing particularly romantic or glamorous about it. You were a three-time All-American volleyball player in college, right? That is true, yeah. I began playing when I was 12 years old and loved it. And by the time I was 16, we had kind of shocked the volleyball world by winning the Junior Olympics. So then I ended up getting recruited to play at [the University of California] Santa Barbara. Do you still get out there and play sometimes? A little bit. I do a little coaching, and sometimes that involves a little bit of playing. [Laughs] But I can't jump anymore. What are your favorite movies to watch and music to listen to? Ooh, oh, my gosh. So you are about to reveal that I'm almost completely checked out of pop culture by virtue of the work I do and the crazy life I lead. I couldn't even tell you who won the Academy Awards, which is frustrating because there was a time back in the '90s when I knew everything. I could play Trivial Pursuit and you wanted me on your team. [Laughs] And if I tried to play Trivial Pursuit with you right now, you wouldn't want me on your team.